World leader in design and manufacture of innovative sensing solutions that enhance safety, security, and energy efficiency. 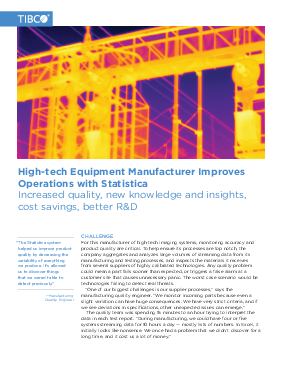 For this manufacturers of high-tech imaging systems, monitoring accuracy and product quality are critical. Any quality problem could mean a part fails sooner than expected, or triggers a false alarm at a customer site that causes unnecessary panic. By setting up automated manufacturing analytic workflows with the TIBCO StatisticaTM platform, the company can complete complicated processes in just a few minutes and improve product quality by decreasing the variability of everything they produce.